Goliath | Let their light shine! The Bible tells us that Goliath was over 9 feet tall. (read the story in 1 Samuel 17). 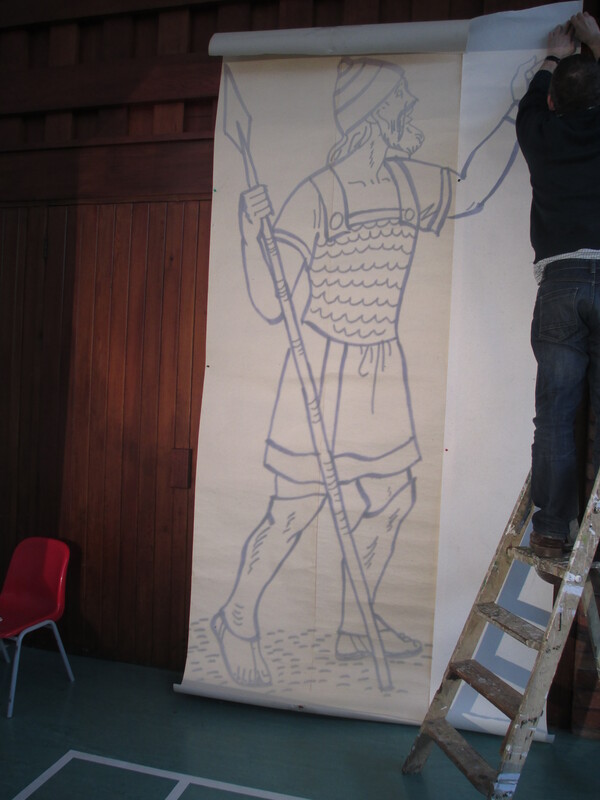 It isn’t always easy to imagine just how tall someone is so we made a life size Goliath. The basic technique for doing this can be used for many pictures and would be very good for making scenery/background. Rolls of lining paper (plain wall paper). This is much thicker than the rolls of painting paper and so will stand up to being hung from a wall better. Copy or trace your picture on to the acetate. Unroll your paper (We did this well in advance so it didn’t keep rolling up again!). You may need several widths of this tapped together. Use cellotape on one side only. 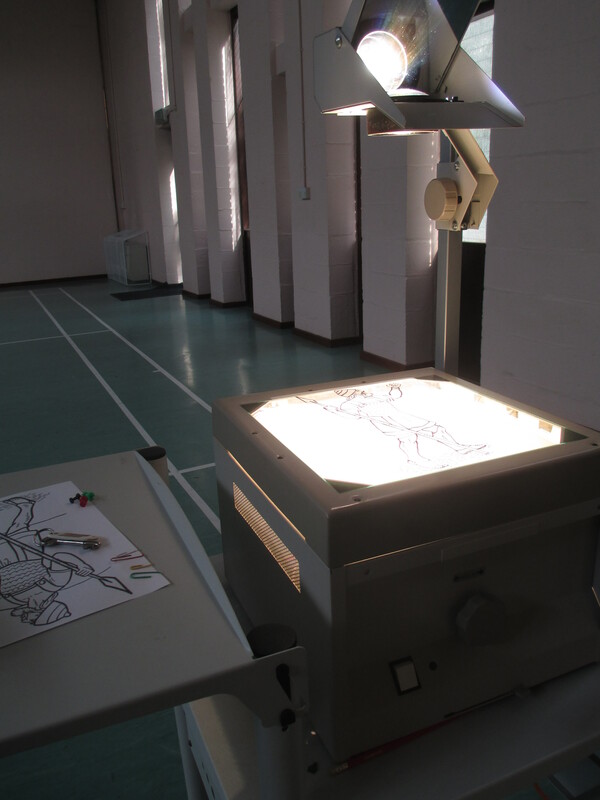 Position the overhead projector so that your acetate image is projected on to the paper. Lay paper on the floor and go over the lines with marker pen. Use the original image as a reference for details. Colour/paint your picture if you wish – we left Goliath black and white. If you use a large picture of Goliath plan where you can display it. Refer to it during the story. 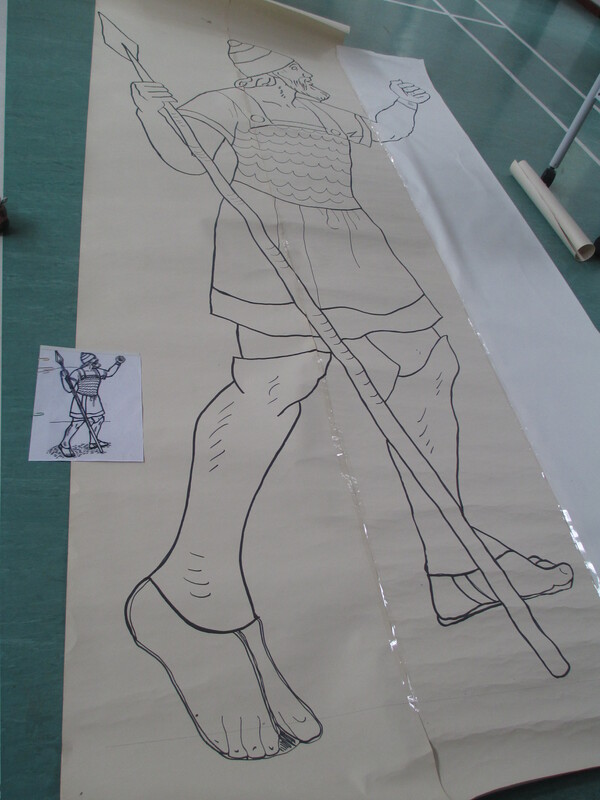 The children can enjoy comparing their height with Goliath. You could have an adult dress up as David to show the contrast.